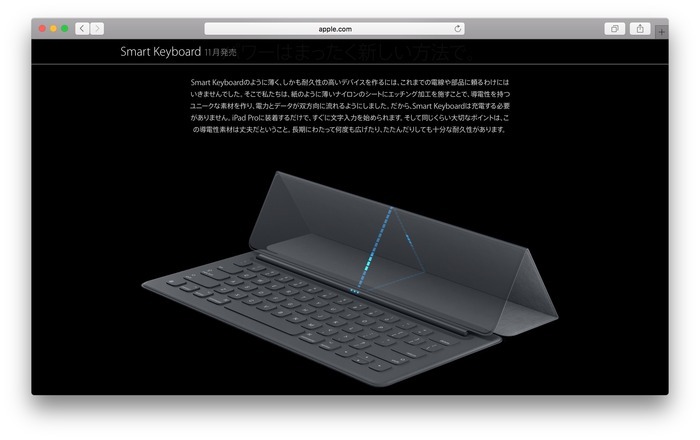 iPad Proのハンズオン動画が公開。Smart Keyboardはペアリング不要でバッテリーは搭載されておらずiPad Proのみで利用可能。 | AAPL Ch. There’s also an iPad cover that doubles as a “smart” keyboard, that will sell for $169 with iPad Pro. One difference between it and other accessory keyboards is that it’s covered in connective fabric, and the keyboard itself has no internal battery. It’s powered entirely by the iPad.